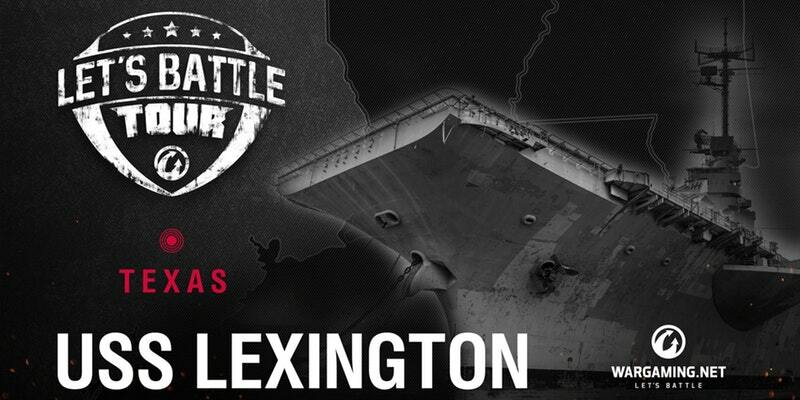 Last year’s Let’s Battle Tour, a nation-wide tour focused on giving back to you – our passionate community of Wargamers, was a massive success and we are excited to announce that tickets for our third stop at the USS Lexington are NOW AVAILABLE. To make this year’s tour even bigger and better than before, 100% of the Let’s Battle Tour ticket proceeds will be donated to our Project V.A.L.O.R. (Veterans & Loved Ones Responsibility) charity program and divided up between all four charities. For more information on Project V.A.L.O.R., please click HERE. Every event is open to players of all ages (that includes kids and families). 21+ is required for alcoholic beverages. Tickets are non refundable, however 100% of proceeds will still go towards Project V.A.L.O.R. charities. Edited by CabbageMechanic, Aug 22 2017 - 19:36. My wife and I already have our tickets and plan on meeting a friend down in Corpus Christi. We are hoping that some of our more notable personalities on YouTube (such as Claus) are there. Edited by Taggeth, Aug 23 2017 - 23:14. Already registered and very excited for this event. I did my first carrier quals on the Lex in T-28's back in 1980, Now it's a museum. Do I feel old? Why, yes. Yes I do! Lol, both my ships are coral reefs in Hawaii. Ironically I was on the USS Essex (LHD-2) amphibious assault ship. Have a ticket and hope to attend but will this event still be happening due to Harvey?? Higher powers than I are debating it around the office. I'm sure an official statement will be made on the Go/No-Go decision. We are doing something else with local charities, I believe. Yes, the optics are an issue. But I hope we go. Personally, I can find arguments in favour. In a month's time, the big problem is going to be that because the economy in the area is hard-hit, workers and businesses will be struggling. One can focus now on the aid charities, but Katrina showed that the big problem in subsequent couple of months was really companies going out of business either because of a lack of demand for their services, or simply because the place of business had to be condemned. Where do guys get the money to pay their mortgages, which haven't gone away? So if we do an event in Corpus Christi, would we be keeping, say, a local food vendor or table rental company afloat? How about hotels? Would Lexington like the help, maybe to repair storm damage to the ship? And would folks in the area appreciate the diversion after a month of rebuilding by having something fun to do? In other words, is our concern about appearing sensitive actually going to cause less good than going? Not that simple a decision. As for going to the Lexington, I would say go. The reason being that it would be good for people to get a break after the devastation and recovery. It would be a bit of a return to normalcy which is what people need to feel. I live in Corpus Christi and the Lex is holding up fine. I'm getting my ticket this week and can't wait to go. Kaiser hit the nail on the head, after everything that has happened it would bring a sense of normalcy. A bit off topic, but anyone know how is the USS Texas holding up? She was leaking bad before the storm. As for the event, yeah, I'd say go too. A return to normalcy can be every bit as good as money spent on rebuilding. I have friends in Corpus Christi and they do hope the event happens for the same reasons folks mentioned above. Economic and getting back to some form of stable normalcy. Hope it happens but understand either way. All the best to the people of Texas and Corpus Christi. Not to be a downer but Corpus Christi is gone, Dance. It was wiped from the map. I just called a hotel in the area and they are going to be full with first responders. I really want to go since it is only 6 hours away but I don't know if I can do the 12 hour drive in one day. Folks in Corpus want this to happen. BTW, we live in Houston. We made reservations long ago and better check to see if the hotel will still honor them. Edited by Porcelain_Throne_God, Sep 06 2017 - 17:15. Dang. The moment I move from Texas, Wargaming comes to Texas. Go figure. Anyways, the USS Lexington exhibit is a good place to visit.